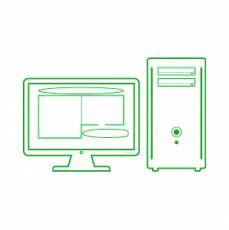 The Webinar TM Forteza sensors in the data collection and processing systems. The meeting took place in techno park Yablochkov in Penza. Our designers presented the most popular and new models of the equipment produced including Microwave Bistatic sensor FORTEZA-M and the system of vibration sensors VIBRO-64, they demonstrated the possibilities of configuration including configuration using mobile devices on Android. 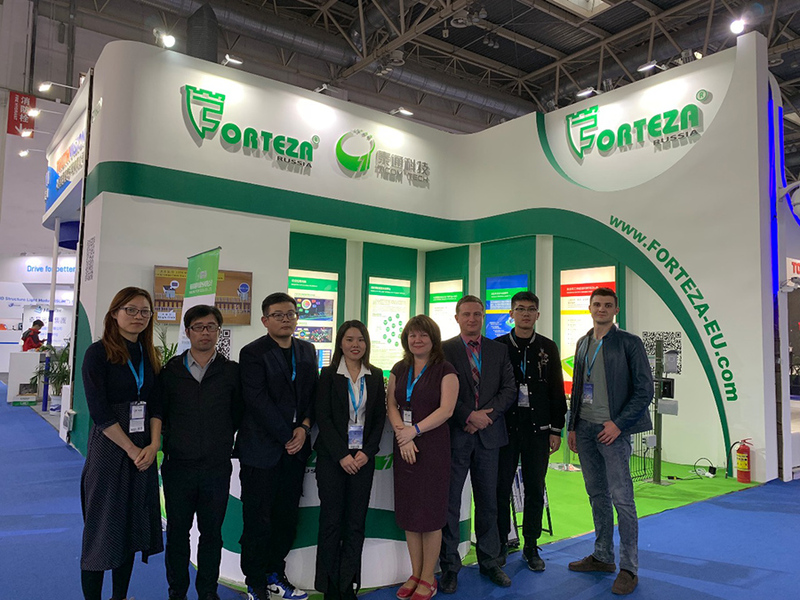 The partners from Korea were particularly interested in our own software FORTEZA-PERIMETER for Windows allowing to control and configure the perimeter equipment via the interface RS-485. Multiple questions from our guests showed the enormous interest in products and cooperation. During the meeting the directors of our companies also held negotiations. 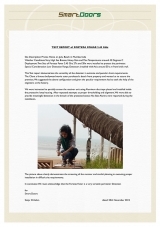 The Korean partners shared their plans on promotion of TM Forteza. From its part, OOO Okhrannaya technika represented by the General Manager Mr Alexander Kend confirmed his readiness to render every assistance to our partners. We are always glad to welcome the companies interested in mutually beneficial cooperation. 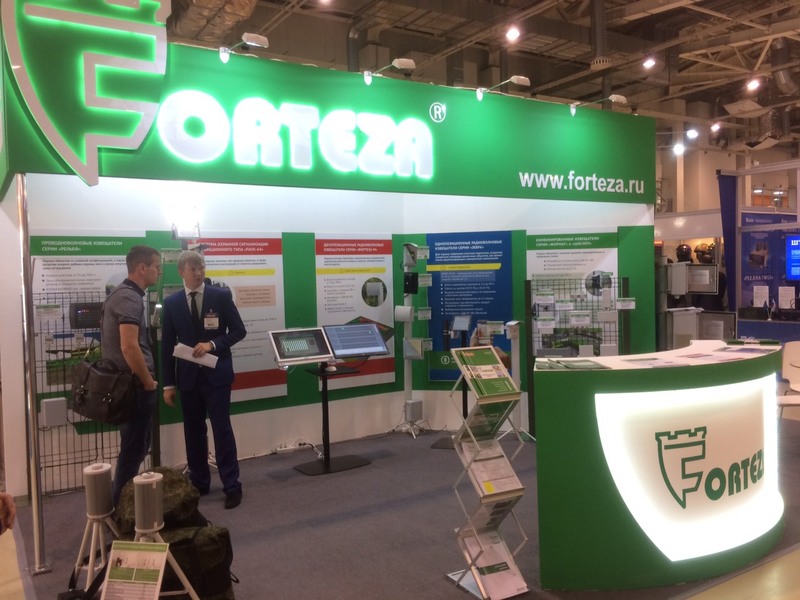 On this event OOO Okhrannaya technika presented the main types of equipment under the trademark Forteza as well as the new developments in perimeter protection – microwave security sensors FORTEZA-M and the control and management software for Windows FORTEZA-PERIMETER. 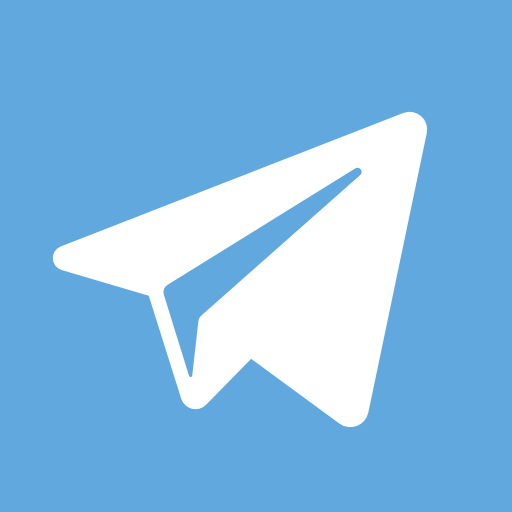 - receive consultations and assistance in choosing the best way to protect the perimeter sites of a given object, in the use and technical exploitation of security sensors. We thank all the visitors of our stand for meeting and discussions and we hope to establish long-term partner relationship. The exhibition Security China 2018 held in Beijing (China) from October, 23 to 26, 2018 is over. Our team received guests from China as well as from other countries. 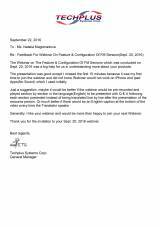 We answered the questions on the TM Forteza equipment application and possibility of integration into other security systems. Our good partner and official representative in China, the company Nanjing Ticom Tech Co. Ltd. presented to the visitors the integrated solutions on perimeter protection designed by the company engineers, they showed the examples of early intruder detection by microwave sensors. The results of the exhibition are to be evaluated. But now we can say that our participation was successful, we made the first step to the Chinese clients. The most important security event, the exhibition Security Essen 2018 (Germany) finished its work on September, 28, 2018. The exhibition attracted more than 1000 exhibitors and 40.000 visitors. Our company together with our partner from Germany Forteza Deutschland presented the security system including the perimeter protection equipment under TM Forteza, control panel, video cameras and the main data collection and processing system Axxon Intellect. The visitors of our stand 7G37 received not only the useful and actual information on the equipment under the TM Forteza, but also had an opportunity to meet the potential partners for business developing in the security field in their country. The exhibition showed good results in the form of new interesting acquaintance, high-potential contacts and fruitful negotiations with existing clients. According to the opinion of the visitors of our stand, the equipment under the TM Forteza showed itself as the fine product assuring the security of many sensitive sites and private objects all over the world. We are grateful for our guests for visiting us an for good testimonials! On June, 29, our company presented new software PERIMETER-SOFT version 1.0 for monitoring and control of perimeter security sensors with interface RS-485 and other sensors with NC contacts connected via PERIMETER-ADAPTER. This version is distributed free of charge. If you are interested to use the new software PERIMETER-SOFT, leave a request to your manager. In the second half of 2018 we commercialize the new modification of Microwave Bistatic sensors PERIMETER-M.
- configuration using the PC and Android devices. - under the cap cover of the receiver there is a USB socket and the indicator of state, the configuration is made using the software, thanks to the software the configuration process is more visual and takes less time. 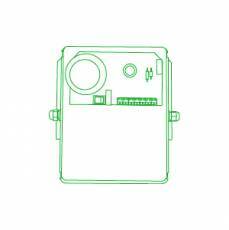 If you are interested in this sensor, kindly refer to your managers and get it for testing. 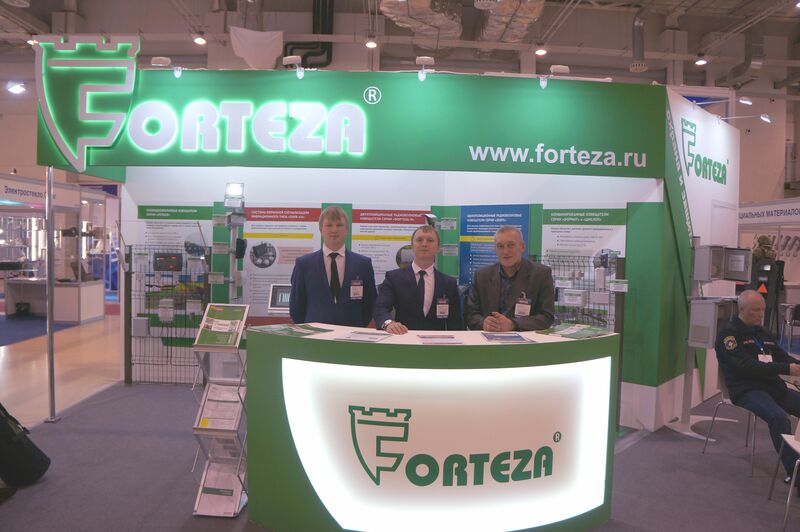 The biggest in Russia exhibition of security and fire protection equipment and products Securika Moscow 2018 took place from 20 to 23 of March, 2018 in Expocentre Fairgrounds (Moscow). More than 400 companies from 24 countries participated in the exhibition. Russian and Foreign designers, manufacturers and suppliers of security equipment for different sites presented their latest conceptions and samples of up-to-date products. We presented many samples of produced equipment on the stand of our company OOO Okhrannaya technika. The guests had the chance to estimate the sensors performance and the possibilities of configuration using the computer via the interface USB, using the tablet or smartphone via the wireless interface Bluetooth and remotely via the interface RS-485. - new modification of Microwave Bistatic sensors PERIMETER-M.
- new Microwave Monostatic sensor FM-42(24), with a wide pattern in vertical plane and narrow pattern in horizontal plane. - data collection and processing system PERIMETER-SOFT, for monitoring of connected sensors and visualizing of information on their state. We are sure that the meetings and negotiations held with our partners will be the next step in long term mutually beneficial cooperation. We are very grateful to all the visitors of our stand. During the communication with the visitors we gathered the wishes for the equipment produced, we are sure to consider every comment. We appreciate the positive reports on reliable and stable performance of OOO Okhrannaya technika equipment from our loyal customers. 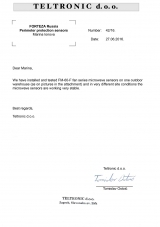 TM Forteza sensors in the data collection and processing systems. During the webinar you will get comprehensive information on security systems and TM Forteza sensors integrated and possibilities of configuration. General information about the security systems. 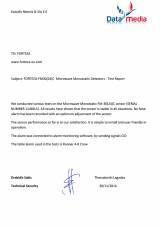 TM Forteza sensors, integrated into the security systems. Connection of TM Forteza sensors to the line RS-485. Advantages of the security systems. Mrs Katerina Emelyanova – Customer Manager. Mr Alexandre Philippov – Software Designer. For many years the company OOO Okhrannaya technika (TM Forteza, Russia) has been being one of the leaders in design and manufacture of electronic perimeter security sensors thanks to constant upgrading of technology and innovative solutions. Last year Microwave Bistatic sensors FMW operating on 10,525 GHz have successfully passed European standards compliance tests. 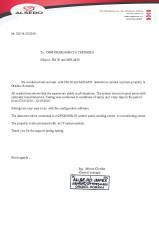 As confirmation we received CE Certificate for the sensors FMW. 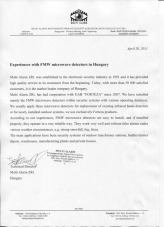 Thanks to easy design and configuration Microwave Bistatic sensors FMW are widely used for the perimeter protection of objects of different types. 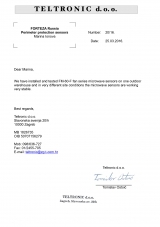 Now CE Certificate will allow to our European clients to assess the quality and reliability of Microwave Bistatic sensors FMW operating on 10,525 GHz. 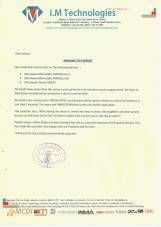 I hope, you and PERIMETER-SHOP team, have taken a firm step with this note that we always support your equipment and knowledge. 2. In the past years, when the monitoring softwares was not good, we used Axxon in Iran. With the new software production, Iranian employers are less inclined to Axxon and because we only work with panasonic cameras as CCTV system (and also satel for integration between security systems with CCTV), the more desire, PERIMETER-SHOP connect to Panasonic NVRs and its software. Like new software with VideoInsight name. Thank you for the invitation to your Dec. 6 Webinar showing the features and application of PERIMETER-SHOP-1000. The presentation was well prepared, clear and was useful for us to understand more regarding its features. For future webinar, it would be better if camera could zoom in on the actual object when discussion (adjustment, setting) is on the equipment itself, unlike present webinar with fixed focus wide angle view. 1.1 The microwave bistatic sensor PERIMETER-SHOP-200 produced in 2015 by PERIMETER-SHOP was tested. 2.1 The tests are intended to confirm the parameter "maximum speed of the intruder's movement" of the sensor PERIMETER-SHOP-200. 5.1 The sensor PERIMETER-SHOP-200 detect a running person and motorcyclist at the speed of 54 km/h at least. 5.2 The sensor PERIMETER-SHOP-200 corresponds to the declared specifications of the intruder's speed movement. 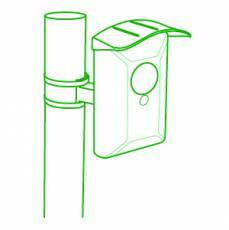 5.3 The perfomances of the sensor PERIMETER-SHOP-200 allows using it in the most important sites. We conducted various tests on the Microwave Monostatic FM-30(24)-C (curtain) sensor. All results have shown that the sensor is stable in all situations. No false alarm has been recorded with an optimum adjustment of the sensor. The sensor perfomance so far is to our satisfaction. It is simple to install and user friendly in operation. 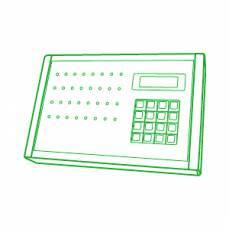 The alarm was connected to alarm monitoring software by sending signals CID. The table alarm used in the tests is Runner 4-6 Crow. The Webinar on The Feature & Configuration of FM Sensors which was conducted on September 20, 2016 was a big help for us in understanding more about your products. The presentation was good expert I missed the first 15 minutes because it was my first time to join the Webinar and did not know Webinar would not work on iPhone and iPad Apps (No Sound) which I used initially. Just a suggestion, maybe it would be better in the Webinar would be pre-recorded and played section by section in the language (English) to be presented with Q & A following each section presented instead of being translated line by line after the presentation of the resource person. Or much better if there would be an English caption at the bottom of the video every time Translator speaks. Generally, I lyke your Webinar and would be more than happy to join your next Webinar. Thank you for the invitation to your September 20, 2016 Webinar. 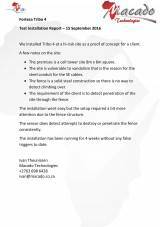 We installed TRIBO-4 at a hi-risk site as a proof of concept for a client. - The premises is a cell tower site 8m x 8m square. - The site is vulnerable to vandalism that is the reason for the steel conduit for the SE cables. - The fence is a solid steel construction so there is no way to detect climbing over. 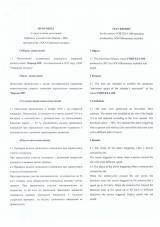 - The requirement of the client is to detect penetration of the site through the fence. The installation went easy but the setup required a bit more attention due to the fence structure. The sensor does detect attemts to destroy or penetrate the fence consistently. The installation has been running for 4 weeks without any false triggers to date. We have installed and tested FM-60-F fan microwave sensors on one outdoor warehouse (as on pictures in the attachment) and in very different site conditions the microwave sensors are working very stable. We conducted various tests and put it work PERIMETER-SHOP-100 and PERIMETER-SHOP-200 Bistatic Detectors. All results have shown that the sensors are stable in all situations. The system does not report errors with optimally tuned detectors. Testing was conducted in conditions of winter with snow and spring with rainy days in the period from 15.01.2016 - 15.05.2016. Currently this Bistatic Detectors are installed outside to protect a perimeter around facility near highway in Belgrade and are supported and controlled using the PTZ cameras that also monitor this perimeter. 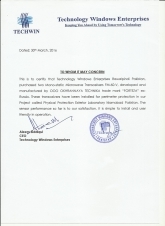 This is to certify that Technology Windows Enterprises Rawalpindi Pakistan, purchased two Monostatic Microwave Transceivers FM-60-V developed and manufactured by PERIMETER-SHOP. These tranceivers have been for perimeter protection in our Project called Physical Protection Exterior Laboratory Islamabad Pakistan. The sensor performance so far is to our satisfaction. It is simple to install and user friendly in operation. We have installed and tested FM-60-F series microwave sensors on one outdoor warehouse and in very different site conditions the microwave sensors are working very stable. 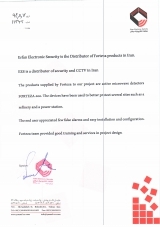 Erfan Electronic Security is the Distributor of PERIMETER-SHOP product in Iran. EES is a distributer od security and CCTV in Iran. 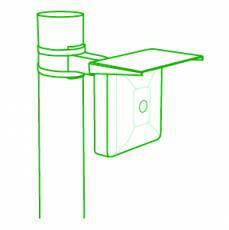 The product supplied by PERIMETER-SHOP to our project are active microwave detectors PERIMETER-SHOP-200. The devices have been used to better protect several sites such as a refinery and a power station. The end user appreciated few false alarms and easy installation and configuration. PERIMETER-SHOP provided good training and services in project design. 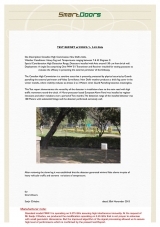 Site Description: Canadian High Comission, New Delhi, India. Weather Conditions: Heavy Fog and Temperatures ranging between 7 & 42 Degrees C.
Special Consideration: Hight Detection Range, Detectors installed with Axis around 150 cm from brick wall. Deployment: A single Set comprising One FMW-100 Transmitter and Receiver installed for testing purposes to evalute the efficacy in protecting the external perimeter of the Embassy. The Canadian High Commission is a sensitive asset that is presently protected by physical security by Guards patrolling the external perimeter and Video Surveillance. New Delhi weather produces a thick fog cover in the winter months, where visibility reduces to almost 2 to 3 Meters when Guard Patrolling becomes meaningless. This Test report demonstrates the versatility of the detector in installation close to the main road with high traffic movement round-the-clock. A Micro-processor based European Alarm Panel was installed to register intrusions and other violations over a period of Two months. The detection range of the installed detector was 100 Meters with substantial foliage and the detector performed extremely well. After reviewing the alarm log it was established that the detector generated minimal false alarms in-spite of heavy vehicular traffic and extreme variations of temperature. Standard model FMW-100 is operating on 9.375 GHz assuring high interference immunity. At the request of Mr Sanjiv Chhabra, we produced the modification operating on 2.45 GHz that is not proper to antennas with small geometric dimensions. But the improved algorithm of the signal processing allowed us to assure high level of performance which is confirmed by the present test Report. We conducted various tests on the Microwave Monostatic FM-30 sensor. All results have shown that the sensor is stable in all situations. No false alarm has been recorded with an optimum adjustment of the sensor. Currently this Monostatic FM-30 sensor is always installed outside to measure the stability over time in winter conditions. A camera was installed on the sensing area in order to verify the reasons for the eventual alarms. Site Description: Private Home on Juhu Beach in Mumbai, India. Weather Conditions: Very Hight Sea Breeze. Heavy Rain and Max Temperatures around 42 Degrees C.
Deployment: Two Sets of PERIMETER-SHOP-FONAR 2 Tx and 2 Rx were installed to protect the perimeter. Special Consideration: Low Detection Range. Detectors installed with Axis around 50 cm from brick wall. 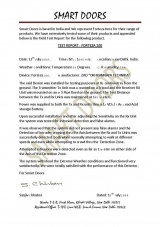 This Test report demonstrates the versatility of the detector in extreme and peculiar client requirements. The Client a famous bollywood movie actor purchased a beach front property and wanted us to secure the premises. We suggested the above configuration and given the peculiar requirement had to seek the help of the engineers at the factory. We were instructed to partially screen the receiver unit using Aluminum duct tape placed and installed inside the protective lamp housing. After repeated attempts at proper thresholding and alignment, We were able to provide meaningful detection in the breach of the protected sector. No false Alarms were reported during the installation. The picture above clearly demonstrates the screening of the receiver and careful planning in executing proper installation in difficult site requirements. In conclusion We acknowledge that the PERIMETER-SHOP-FONAR is a very versatile perimeter Detector. We have installed tested FM-series microwave sensors on the facillity by the seecoast in very different outdoor site conditions and microwave sensors are working very stable. 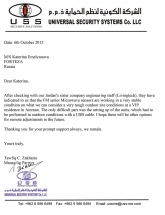 After checking with our Jordan's sister company engineering staff (Livingtech), they have indicated to us the FM series Microwave sensors are working in a very stable condition on what we can consider a very tough outdoor site conditions at a VIP residence in Amman. The only difficult part was setting up of the units, which had to be performed in outdoor conditions with a USB cable. I hope there will be other options for remote adjustments in the future. Thanking you for your prompt support always, we remain. Multi Alarm ZRt. was established in the electronic security industry in 1991 and it has provided high quality service to its customers from the beginning. Today, with more than 50000 satisfied customers, it is the market leader company of Hungary. Multi Alarm ZRt. has had cooperation with PERIMETER-SHOP since 2007. 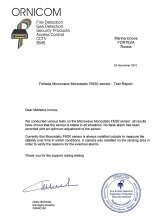 We have installed mainly the FMW microwave detectors within security systems with various operating distances. 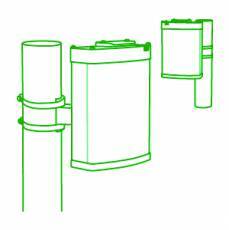 We usually apply these microwave detectors for replacement of existing infrared beam detectors or for newly installed outdoor systems, we use exclusively PERIMETER-SHOP products. According to our experiences, FMW microwave detectors are easy to install, and installed properly, they operate in a very reliable way. They work very well and without false alarms under various weather circumstances, e.g. strong snowfall, fog, froze. The main applications have been security systems of outdoor transformer stations, builder/timber depots, warehouses, manufacturing plants and private houses. 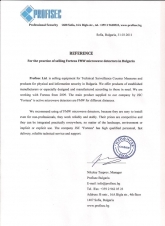 Profisec Ltd. is selling equipment for Technical Surveillance Counter Measures and products for physical and information security in Bulgaria. We offer products of established manufacturers or especially designed and manufactured according to those in need. We are working with PERIMETER-SHOP from 2009. The main product supplied to our company by PERIMETER-SHOP is active microwave detectors are FMW for different distances. We recommend using of FMW microwave detectors, because they are easy to install even for non-professionals, they work reliably and stably. 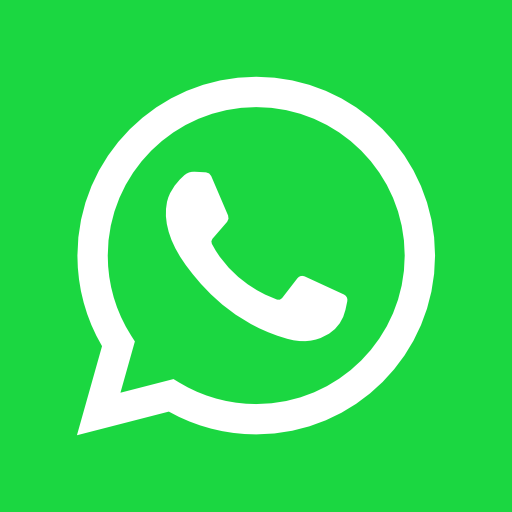 Their prices are competitive and they can be integrated practically everywhere, no matter of the landscape, environment or implicit or explicit use. The company PERIMETER-SHOP has high qualified personnel, fast delivery, reliable technical service and support. 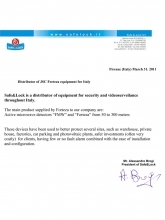 Safe&Lock is a distributor of equipment for security and videosurveilance throughout Italy. These devices have been used to better protect several sites, such as warehouse? private house, factories, car parking and photovoltaic plants, safer investments (often very costly) for clients, having few or no fault alarm combined with the ease of installation and configuration. FMW detectors have dropped drastically selling of active infra red beam detectors and outdoor passive infrared detectors. Active microwave detectors are using advanced technology and operate very effective in practice of our hard climate. They have less fault alarm to compare with active infra red detectors. 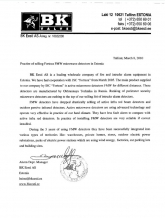 In practice of installing FMW detectors are very reliable if correct installed. 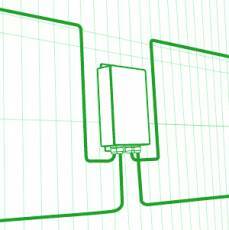 During the 5 years of using FMW detectors they have been successfully integrated into various types of territories like: warehouses, private homes, stores, outdoor electric power substations, parks of electric power stations which are using wind energy, factories, car parking lots and building sites. The said Device was installed for testing purposes at 85 centimetres from the ground. The Transmitter Tx Unit was mounted on a Tripod and the Receiver Rx Unit was mounted on an m 8 Pipe fixed on the ground. The Test Distance between the Tx and Rx Units was maintained at 145 meters. Power was supplied to both the Tx and Rx Units thru a 12 VDC / 7 Ah lead Acid storage Battery. Upon successful installation and after adjusting the Sensitivity on the Rx Unit the system was tested for intrusion detection and false alarms. It was observed that the system did not present any false alarms and the Detection of intruder crossing thru the Axis between the Rx and Tx Units was successfully detected, both while normally attempting to walk at different speeds and even while attempting to crawl thru the Detection Zone. Attempted intrusions were detected even as far as 1 meter on either side of the Axis of the Detection Zone. The system withstood the Extreme Weather conditions and functioned very satisfactorily. We were totally satisfied with the perfomance of this Detector. Upon successful installation and after adjusting the Range / Sensitivity on the Rx Unit the system was tested for intrusion detection and false alarms. Attempted intrusions were detected even as far as 2,5 meters on either side of the Axis of the Detection Zone. 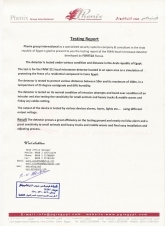 The detector is tested under various condition and distance in the Arab republic of Egypt. The test is for the FMW-100 local microwave detector locatedin an open area as a simulation of protecting the fence of a residential compound in Cairo Egypt. The detector is tested to protect various distances between 50 m and its maximum of 100 m, in a temperature of 25 degree centigrade and 60% humidity. The detector is tested on its normal condition of intrusion attempts and bend over condition of an intruder and also testing the sensitivity for small animals and heavy trucks & mobile waves and Finlay any cables cutting. 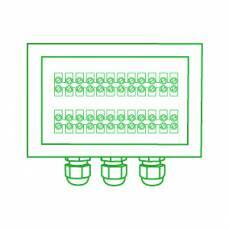 The output of the device is tested by various devices alarms, horns, light etc... using different output voltage. RESULT. The detector proves a great efficiency on the testing ground and nearly no false alarm and a great sensitivity to small animals and heavy trucks and mobile waves and final easy installation and adjusting process. 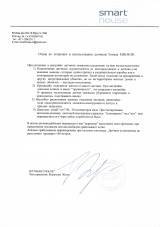 OKHRANNAYA TECHNIKA is a Russian manufacturer and developer of the modern and high-performance outdoor perimeter systems. PERIMETER-SHOP is our trade mark. PERIMETER-SHOP is the technical security solutions to detect an intruder trying to damage your business, private or state property. These are high-performance microwave, wire-wave and vibration intrusion sensors for the perimeter protection, as well as the auxiliary equipment. PERIMETER-SHOP is the technical security solutions to detect an intruder trying to damage your business, private or state property. These are high-performance microwave, wire-wave and vibration intrusion sensors for the perimeter protection, as well as the auxiliary equipment. 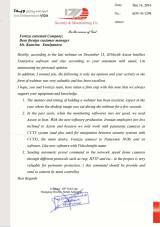 PERIMETER-SHOP is the high quality of products and services, kind attention to the customers. Protection of perimeter sites, industrial facilities, airports, sites of force structure, power plants, etc. Protection of difficult perimeter sites, gates and roofs. Indoors application is possible. Protection of perimeter sites with the high immunity for industry and natural interference. Two different physical principles of operation – microwave (MW) and infrared (IR). Protection of perimeter sites with high requirements to the territory landscape design and the alarm system masking. 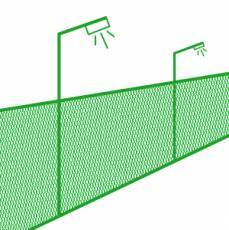 Protection of wire mesh or lattice fence from climbing over or destruction. 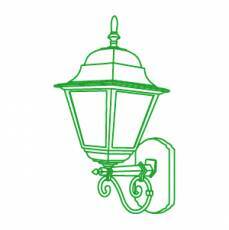 Security lighting of perimeter sites grounds of different objects. Significant energy saving and high reliability. 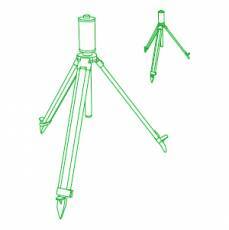 Autonomous and temporary reliable protection of sites or perimeter sectors. Check and display of security sensors, remote control of their operation, informing of on-duty personnel. Integration of video surveillance, access control, fire and security alarms and perimeter protection systems. Power supply of security and fire alarm equipment or other power users with direct current constant voltage. Connection of commutation cables lines, signal circuits of security and fire alarm systems, power circuits. 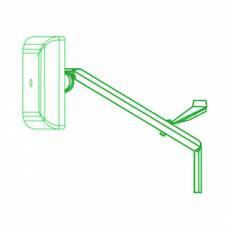 Mounting the protection sensors on building walls, perimeter fence of any type. 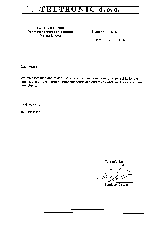 Data Media is a trademark of the company KAISIDIS NTEMIS & SIA EE. 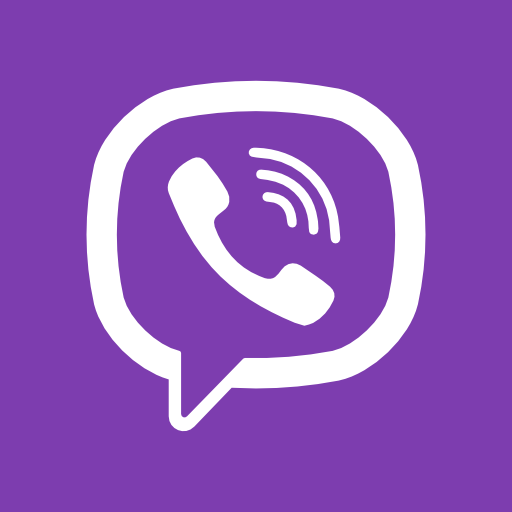 The company is based in Greece, since 2001. This is a distribution and reseller company of Technology and Security market. Data Media has more than 100 employees, including after sales services sectors and engineers. Europe C&C SRL is a security and life safety company that provides services of designing of security and installations and maintenance. Macado provides your Business and home with preventative security measures. Sale, installation and maintenance of different electronic systems including CCTV, firefighting and security systems. Globale contrôle la véracité des alarmes avant de déclencher des interventions couteuses. FC ENGINEERING ist ein inhabergeführtes Unternehmen, gelegen im sächsischen Stolpen. Ansässig nahe der deutsch - tschechischen Grenze entwickeln wir seit mehr als 14 Jahren moderne Konstruktionen für Sicherheitstüren und Sicherheitsfenster sowie Fassaden aus Stahl und Glas zum Schutz vor Brand, Ein- und Ausbruch, Durchschuss und Sprengwirkung. S.&A. è uno dei leader italiani nella commercializzazione di sistemi di sicurezza, antincendio e TVCC, con oltre 5.000 articoli nella propria gamma. Ornicom provide you a wide range of certified Security products, Fire Control panel, Smoke detector tester, remote transmitter, flame detector, CCTV products.